Tesco is marking its centenary by offering community projects in Exeter the chance to bag their share of a huge £100,000 funding pot. As part of the supermarket’s anniversary celebrations, community organisations from across Exeter are being invited to share in the funding during two special Bags of Help voting rounds. Bags of Help, run in partnership with the charity Groundwork, sees funding awarded to thousands of local community projects every year. So far in Exeter Bags of Help has awarded £110,408 to 32 local projects. A SOUTH Devon care firm is inviting anyone wishing to do more for their rural community to sign up to its good neighbours’ initiative to provide care in the area where they live (January 2018). Kind-hearted customers at Tesco stores across Exeter have donated thousands of meals to people in need this Christmas. Shoppers gave 11,171 meals for food charities FareShare and The Trussell Trust during the Tesco Food Collection, which ran in stores in Exeter from 29 November to 1 December. DEVONIANS are being encouraged by a care provider in the county to spread some festive cheer this Christmas among any elderly and vulnerable neighbours or relatives they might have (December 2018). Christmas can be a bleak time for anyone living alone and Guardian Homecare, which provides care in south Devon and has offices in Exeter, is asking people to check on relatives and neighbours. A friendship formed at an Exeter community centre has given confidence back to short story writer, Linda Lewis. When Linda moved back to Exeter in 2017, the first thing she did was go to the Beacon Community Centre’s Friday drop in. There she met Pearl Palmer, a lady who enjoyed reading magazines like the People’s Friend. At that time, Linda had lost her confidence. “I have sold hundreds of stories to magazines but when I told people I was a writer, they assumed I meant novels, “ said Linda. Broadclyst Community Primary School (BCPS) has been reaccredited with the British Council’s prestigious International School Award in recognition of its work to bring the world into the classroom. 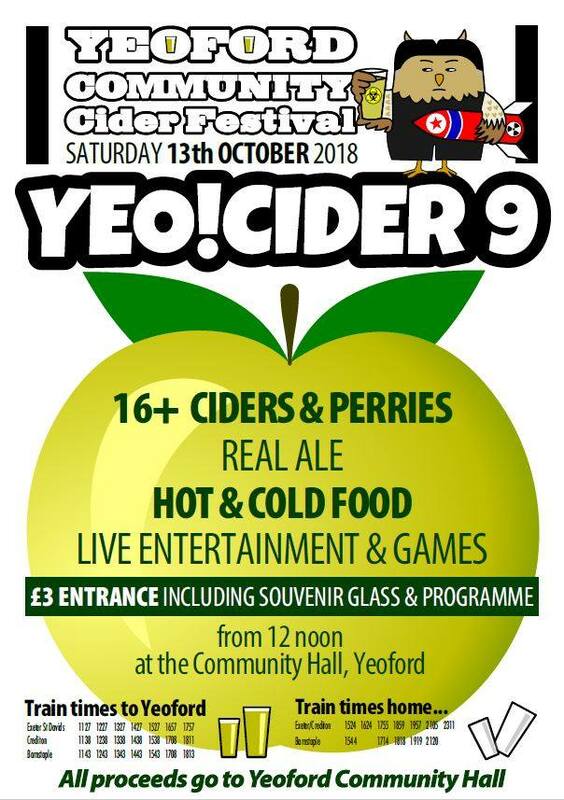 Come and join us at our ever popular annual cider festival. This year we have 16 ciders and perries plus real ale and ginger beer. And as always, some tasty hot and cold food to wash it all down, plus the finest of musicians to entertain us throughout the afternoon. All proceeds go towards Yeoford Village Community Hall. Yeoford is on the Exeter to Barnstaple train line so no one needs to drive.